Tuning guitars and other stringed instruments is a lot less fun than playing them. Perhaps more to the point, it’s a bit subjective. Accurate tuning is essential if you’re playing with other musicians, or recording. Electronic tuners have existed for decades – some of the early ones were pretty wild. Our digs are littered with Korg chromatic tuners, matchbox-size devices which will listen to whatever’s being tuned and indicate the note it’s playing with a line on an LCD panel. 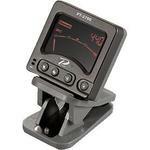 The Profile PT-2700 is decidedly brilliant, and a considerable improvement over simple electronic tuners. It’s a small backlit LCD screen attached to a giant paperclip. Clamp the rubber jaws of the paperclip over the peg head of a guitar, bass or anything else noisy and it will pick up the notes to be tuned through the wood. Its screen displays a conventional moving pointer and the actual note being played, and it changes color. It will turn green when the note being tuned is bang on. Unlike tuners that listen to the outside world through a microphone, the Profile PT-2700 can’t be fooled by extraneous noises. It’s quick, accurate and easier to operate than air. It’s probably worth noting that the display screen of the PT-2700 tuner rotates, should you have observed that the configuration of the device as it’s illustrated at the beginning of this review would have its screen facing away from whoever’s holding the guitar it was attached to. Neither a mirror nor advanced clairvoyance are required to successfully operate it. The Profile PT-2700 has specific modes for guitar, bass and violin, in which it will only display the notes of the strings specific to these instruments, as well as chromatic mode, in which it will tune all notes. It does include one of the aforementioned microphones, should you want to have it tune something that it’s clip-on transducer is inappropriate for. Costing under twenty dollars, the PT-2700 is a superb gadget, and easily worth the price of admission. Be warned, however – if you buy one and your playing still sounds like a cat in a blender, you’ll have no one left to blame.